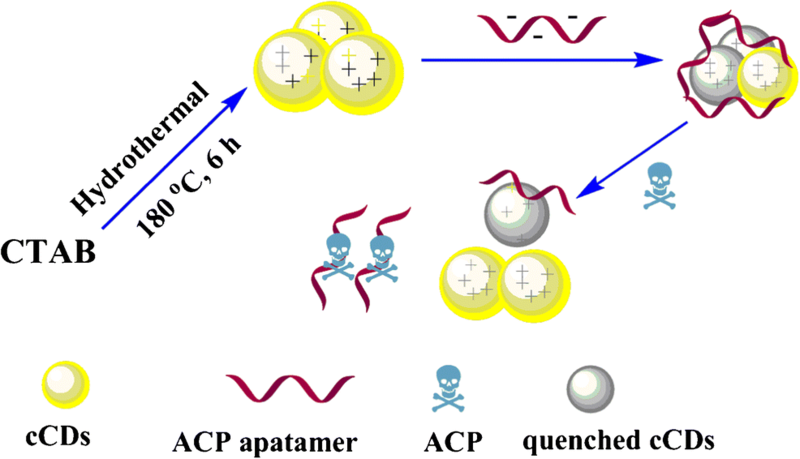 A fluorometric aptamer-based method is described for sensitive detection of the pesticide acetamiprid. Cationic carbon dots (cCDs) with blue fluorescence were synthesized from cetrimonium bromide (CTAB) by a hydrothermal method. In the presence of the acetamiprid aptamers with a negative charge, the aptamers bind to the surface of the cCDs due to electrostatic attraction. As a result, the fluorescence of the cCDs is quenched partially (the best measurement was done at excitation/emission wavelengths of 360/445 nm). If acetamiprid is added to the above system, the aptamer binds to acetamiprid as a target with strong and specific affinity. Therefore, fluorescence increases proportionally to the acetamiprid concentrations. The aptasensor has a detection limit of 0.3 nM with a dynamic range from 1.6 to 120 nM which reveals that the method is sensitive in comparison to the other techniques. The selectivity of the method towards various pesticides was also studied and found to be adequate. 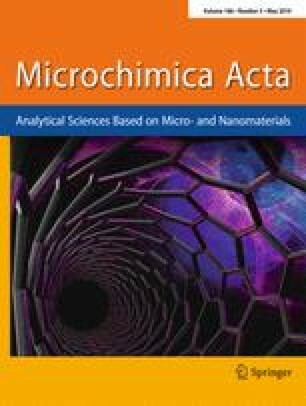 The sensor was applied for the determination of acetamiprid in (spiked) wastewater, tap water, and tomatoes to underpin its practicability. Cationic CDs (cCDs) were synthesized from cetrimonium bromide by a hydrothermal method. The addition of the negatively charged acetamiprid aptamer to a solution containing cCDs, the cCDs will be coated by the aptamer. This causes the blue fluorescence of the cCDs partially is quenched. If acetamiprid (ACP) is then added, the aptamer will bind to acetamiprid with strong and specific affinity. Hence, fluorescence will be gradually restored. The online version of this article ( https://doi.org/10.1007/s00604-019-3378-9) contains supplementary material, which is available to authorized users.